The piles of snow had pretty much vanished in Wetaskiwin. There were many telltale signs of spring – the warmer temperatures, some trees showing the beginning of buds, robins and geese returning and the green grass was beginning to poke its way through the brown cover left over from the previous year. The residents of Wetaskiwin and region knew there were a lot of spring and summer days to do yard work, but there was only April 11th and 12th to attend the Chamber of Commerce Spring Showcase trade show. And they did. A record number of visitors converged on the Wetaskiwin Drill Hall and Arena One to ‘visit and view’. Spring Showcase & FEASTival took an impressive growth spurt for 2015. More than seventy-seven exhibitors showcased their products and services in the Drill Hall and Arena One. Although the 2014 event was a huge success, Executive Director Judi Best continued with her rebuild of the event. Following the tear down of the last display and the last chairs put away at the end of a successful Summer Showcase 2014, Chamber Executive Director, Judi Best commented, “I am already looking forward to next year’s Trade Show and hope I can make it even bigger and better. Planning will be in full swing as soon as we close the doors on this one.” Given the positive comments from both vendors and attendees at Spring Showcase 2015, the Chamber succeeded. The Showcase was rated as very professionally planned and hosted. FEASTival – Some of the City’s best food and drink chefs gathered at the south end of the Drill Hall offering special food and beverages. Tickets were $1 each with samples requiring 1-4 tickets. Local restaurants featured in FEASTival were The Glens, The Castle, Barneys, Cruisers Cafe, Meba Chinese Restaurant, Angelos Pizza, Co-op, How Sweet It Is and the Terracotta Café. New this year – attendees of Spring Showcase helped colour a 7.5 ft. long and 2 ft. high “Wetaskiwin Welcomes You” monster mural that will be framed and hung at the Visitor Information Centre located at the Chamber Office. The Monster Mural featuring the Water Tower, City Hall, Heritage Museum, the Chamber & Visitor Information Centre, the RCMP and much more was a popular resting spot during the entire show. Also new for 2015 included the Friday Night Movie ‘Book of Life’ and Dream After Productions Extravaganzav, offering live music/dance and fashion show. 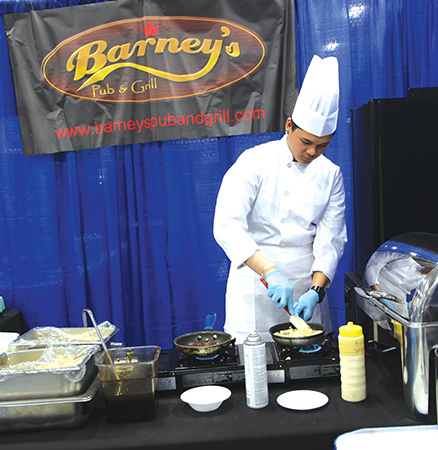 Many local businesses were at the Trade Show creating a great opportunity to meet with them, some for the first time, and learn more about their products and services. As residents slowly made their way through the exhibits, they could be seen sharing information with the exhibitors and visiting with people they don’t regularly see. It is evident the Spring Showcase has also evolved into an important community event.